Your Brand New Super Indian Comics Website is HERE! Super Indian is ALL THAT and a bag of chips. Hooray and Huzzah! It’s finally happened….we’ve marched full on into 2012 and have totally revamped our site. To update the folks who’ve just arrived, the Super Indian Comics website has been going for a number of years. The project started as a radio series for the Native Radio Theater Project and Native Voices at the Autry. Ten episodes were taped before a live audience, then broadcast nationally on the Native Voice One network and the American Indian Radio on Satellite. However, it was always the dream of writer/actor/musician Arigon Starr to expand on the idea of a Reservation Super Hero and use her skills as a cartoonist to create a comic book series using characters and stories from her radio scripts. Super Indian the Comic Book Series was born! 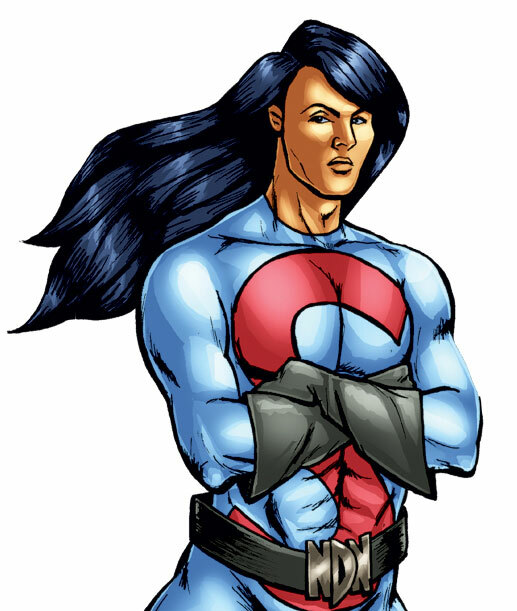 In April 2011, the webcomic series debuted with the introduction of Super Indian Issue #3, “Hubert’s Blog.” The comic storyline was based on one of Starr’s unproduced radio scripts. “You can get as cinematic on the art page as you can in an audio production. The fun of doing a full comic storyline was fleshing out the characters, creating the visual world and having more time to present the story,” said Arigon. Our new format should make it easier to navigate around the comic series. You can actually use your arrow keys on your computer to scroll through the comic pages. We also made it loads easier to “like” us on Facebook and see what’s going on there as well. Building the website is an on-going process, so we hope you’ll enjoy poking around and find something to keep you coming back every Monday. Why, a brand-spanking new episode of “Super Indian” the webcomic.